As I look at the situation, it seems to me that many of the crises around the world are connected to oil supply and the cost of this oil supply. If oil supply gets tighter, there is potential for these crises to get worse. 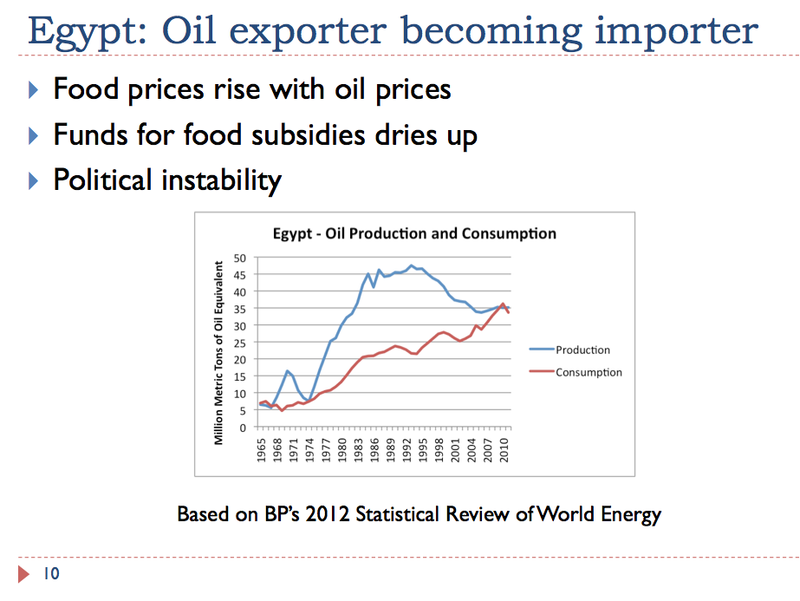 In this talk, I will also show the connection of oil supply limits to some of the financial crises we see today, and to energy security. 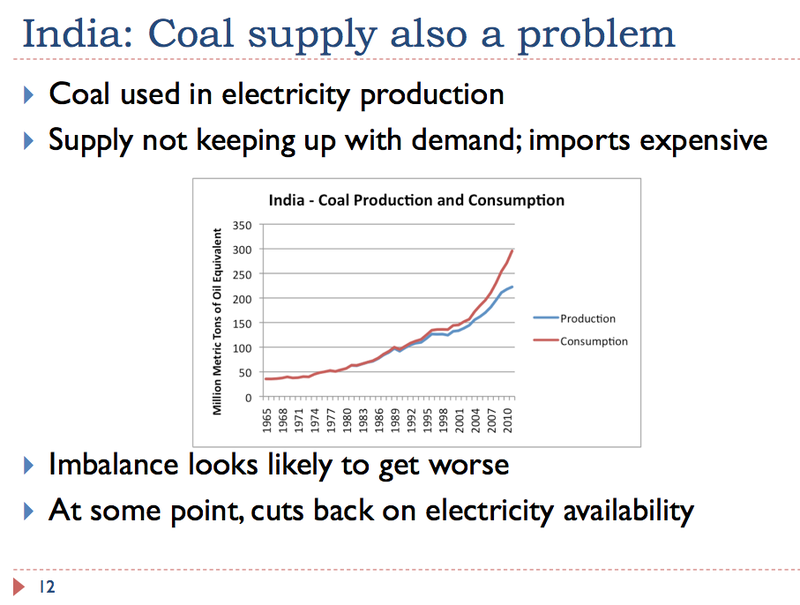 I will also show some slides on the Indian oil and coal situation, and explain some connections to world limits. 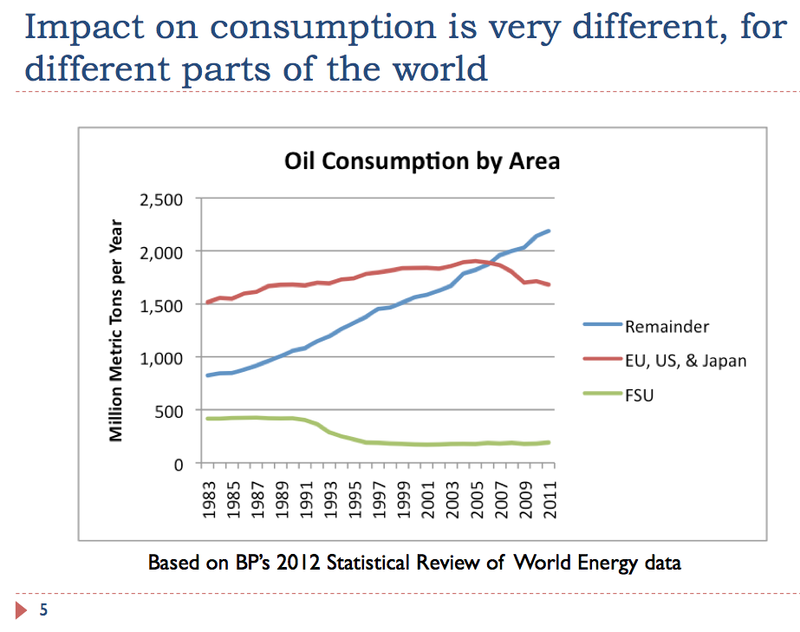 World GDP, oil consumption, and energy consumption tend to move in tandem (Slide 2). While the figures shown above are for the world, the same situation tends to exist for smaller groupings as well. Countries with rapid economic growth tend to use a growing amount of energy, especially oil. This is logical, because making goods and services tends to use energy. For example, growing food and transporting it using modern methods uses oil. Another reason energy consumption and growth in GDP tend to go together is because workers who earn a salary by making goods or services can afford to buy goods and services using oil and other energy products. For example, they may be able to afford to buy a car or to go on a vacation. People who have lost their jobs have much less to spend on goods and services. This is another reason energy (and oil) consumption tends to be higher when more people have jobs–that is during periods of economic growth. 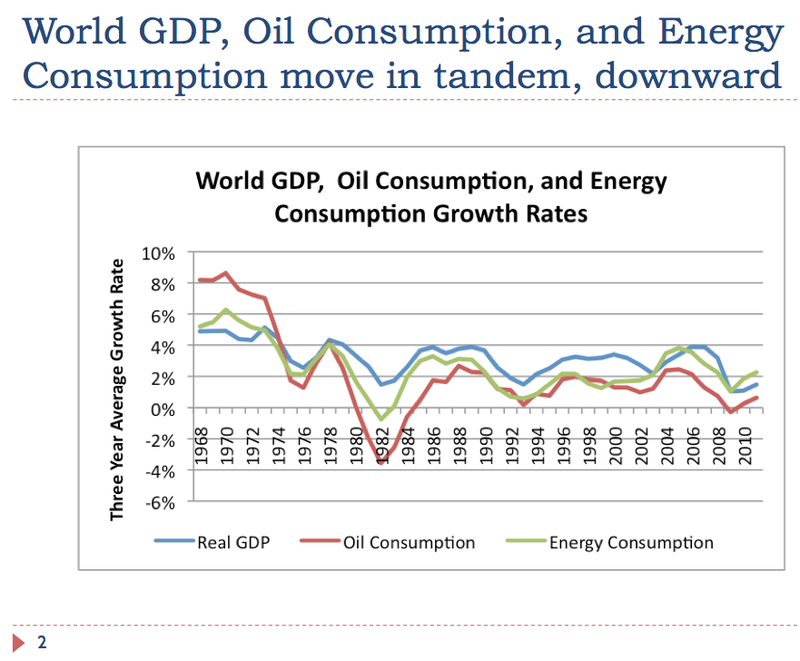 Countries with little economic growth tend to be ones with little growth in oil consumption, and in energy consumption in general. 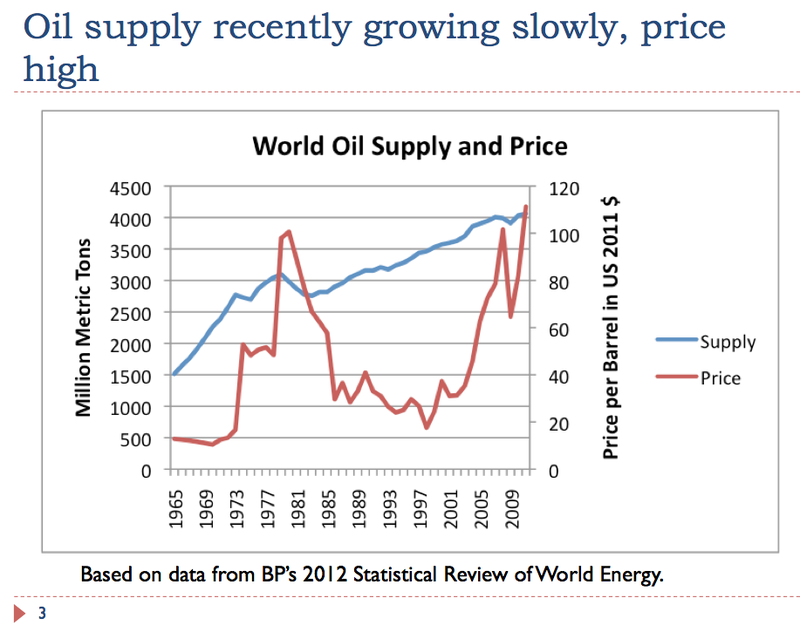 If we look at world oil supply and price (Slide 3), we see that there have been two big price spikes. The first one came in the 1970s and early 1980s, after the oil production of the United States began to fall in 1971. The United States found itself increasingly dependent on imports, leaving the door open for the Arab Oil Embargo. By the mid-1980s, the world got its oil supply problem under control, partly by drilling for oil in new places (North Sea, Alaska, and Mexico) and partly by finding ways to reduce oil consumption (smaller cars; shifting electricity production to coal or nuclear instead of oil). (1) Demand. World demand for oil started rising sharply after China joined the World Trade Organization in 2001. China, India, and other Asian countries began rapid economic growth, leading to a greater need for oil and other energy products. 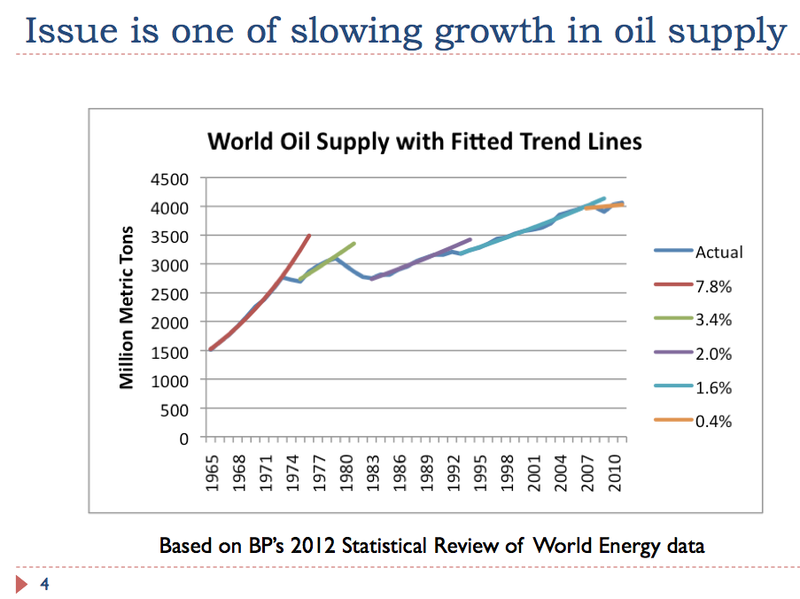 Slide 3 shows world supply did not show any unusual “spurt” to meet this demand. Instead prices began to rise. (2) Supply. To a significant extent, “The easy oil is gone“. What is left in the ground is oil that is both expensive and slow to extract. Two examples of such oil are “shale oil” and bitumen from the Canadian oil sands. Because of high extraction costs, these types of oil need a high sales price to justify their extraction. In fact, a recent report indicates that costs in the Canadian oil sands are soaring. If growth in oil sands production is to continue at forecast levels, oil prices will need to be higher than has recently been the case. If we look at a graph of growth in oil supply with fitted trend lines, we can see that the rate of growth has in fact been declining over time. This is precisely the opposite of what is needed to accommodate the energy needs of rapidly growing countries such as India and China, and is part of the reason for current high prices. (1) European Union, United States and Japan combined. Consumption has fallen since 2005. 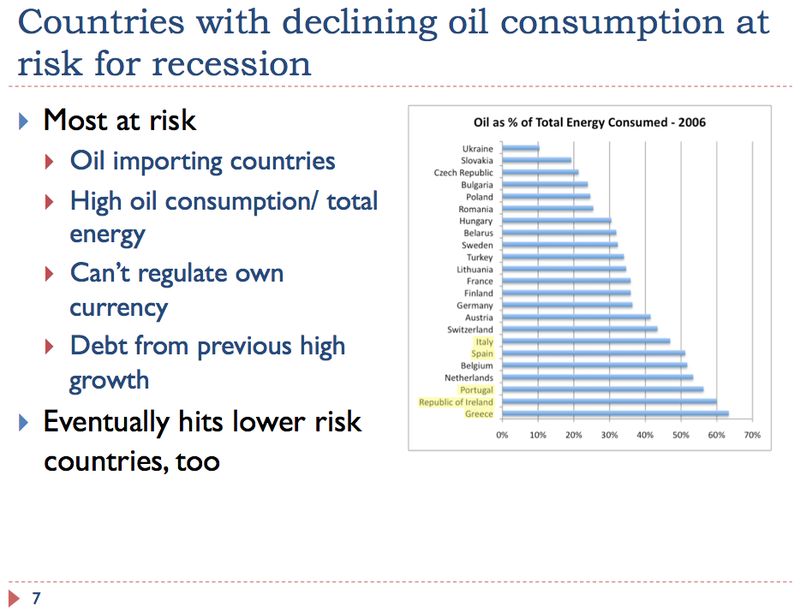 These are precisely the countries with serious recessions in the 2007-2009 period, when oil consumption was dropping rapidly. (2) Former Soviet Union (FSU) – Consumption fell when the Soviet Union collapsed in 1991, and has never recovered. (3) Remainder (many countries, including China, India, and oil exporters) – Consumption grows rapidly, year after year, even though world supply is not growing by much. If world oil supply remains relatively flat (as is recently the case on Slide 4), and the growth pattern shown on Slide 5 continues, it is clear that there will soon be a conflict. Either the EU, US, Japan grouping will need to drop their consumption by more, or the “Remainder” group will need to slow down on their consumption, or both. This pattern could mean slower growth for the “Remainder” grouping, or outright recession for the European Union, US and Japan. (1) Because oil prices are not subsidized, higher oil prices are passed through to consumers. These higher prices lead consumers to cut back on discretionary expenses because oil is used for some of the necessities of life, including food production and commuting to jobs. As a result, people in discretionary industries, such as vacation travel, and restaurants, tend to be laid off. There may also be debt defaults, if laid-off workers cannot afford to repay loans. The combination of these factors leads to recession. 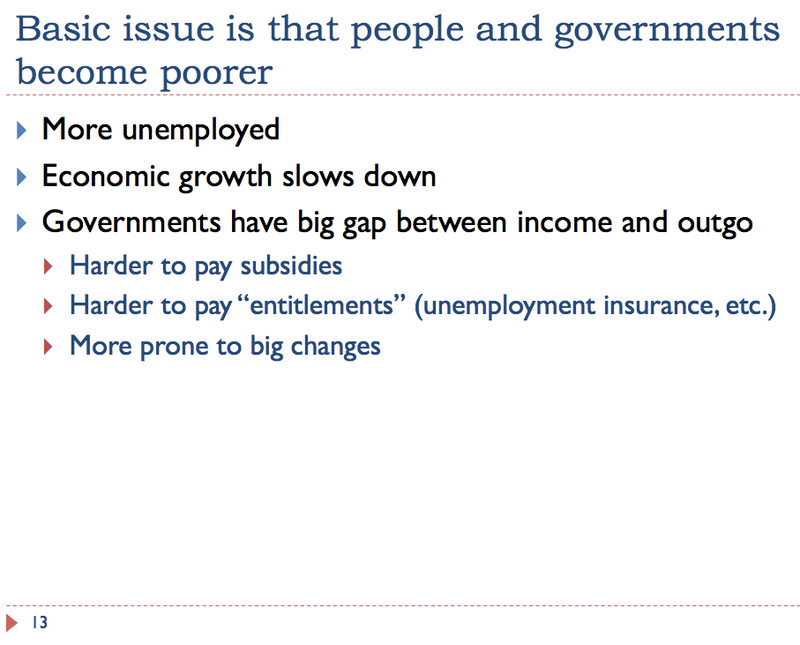 (2) Governments are affected, too, because laid-off workers pay less in taxes. Furthermore, laid-off workers often need unemployment benefits and other benefits to mitigate their circumstances. The government may also choose to “stimulate” the economy, or to bail out banks with bad loans. With all of the additional spending and less revenue, recessionary forces get transferred to the governmental sector. This is why so many governments are now troubled with high debt. (3) In the Euro zone, counties in poor financial condition find it necessary to pay higher interest rates. adding to the country’s financial difficulties. The US has been spared this problem so far, partly because it is viewed as a “safe haven” from Euro problems, and partly because it has the ability to manipulate the level of its currency. Countries vary in their exposure to high oil prices. Oil importers who get a large share of their total energy from oil (as opposed to other types of fuel) seem to be most at risk. The PIIGS (Portugal, Italy, Ireland, Greece and Spain) tend to be countries using large share of oil in their energy mix. A country which can’t regulate its own currency, such as Greece and other Euro countries is at particularly high risk, because of the problem with higher interest rates mentioned earlier (because these countries cannot drop the value of their currency, to make their exports more competitive). Eventually, it seems likely that high oil prices will affect all economies, even those of oil exporters. Extra funds from oil exports do not “make their way” to all consumers. So while some parts of an economy may be booming, others will collapse from lack of funds. Greece provides an example of the dip in oil consumption that occurs when a country enters a recession. Greece’s largest industry is tourism. High oil prices affect consumers’ ability to purchase vacations in Greece. Large multinational companies (such as Coca Cola Hellenic) decide to move out, for more stability, further adding to the country’s problems. With less investment, the country has an even greater tendency to spiral downward. 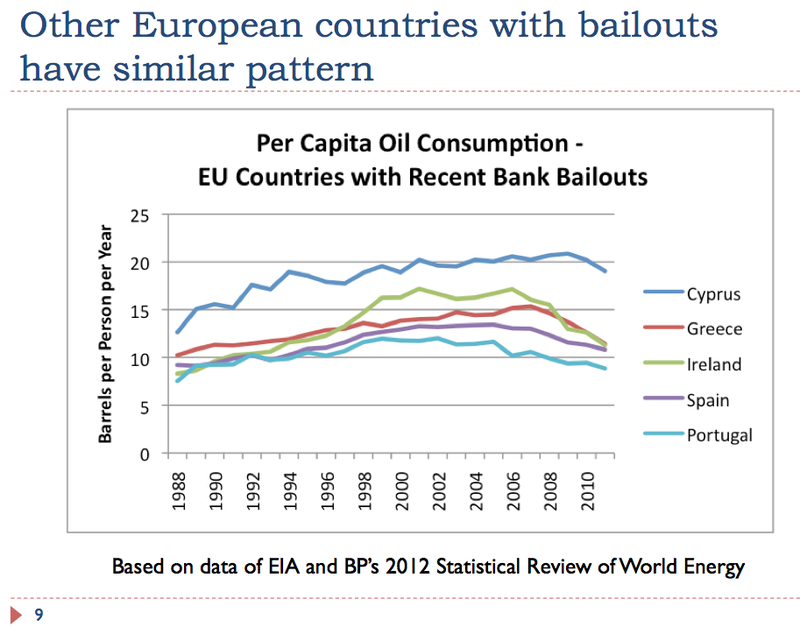 Other European countries requiring bailouts tend to follow a similar pattern to Greece (Slide 9). 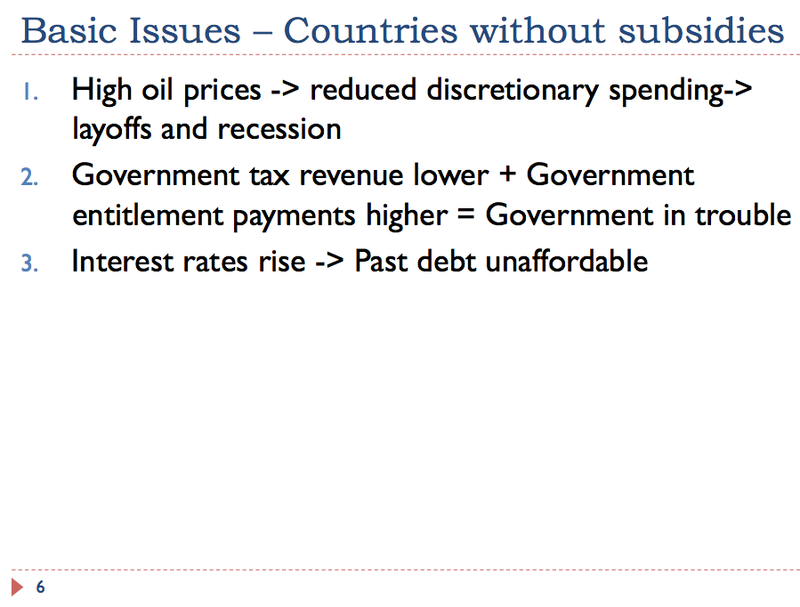 So far, we have been talking about countries which don’t subsidize oil prices. How about other countries? One such country is Egypt (Slide 10). For quite some time, it was an oil exporter. It historically has subsidized both food and oil prices. It has run into problems recently because oil consumption has been rising at the same time that oil production has been falling. Without oil exports to sell, it is very hard to have enough money to fund subsidies of food and oil. Cutbacks in subsidies lead to civil unrest, and the situation starts going downhill quickly. I wrote a post about the Egypt situation earlier, What Lies Behind Egypt’s Problems? 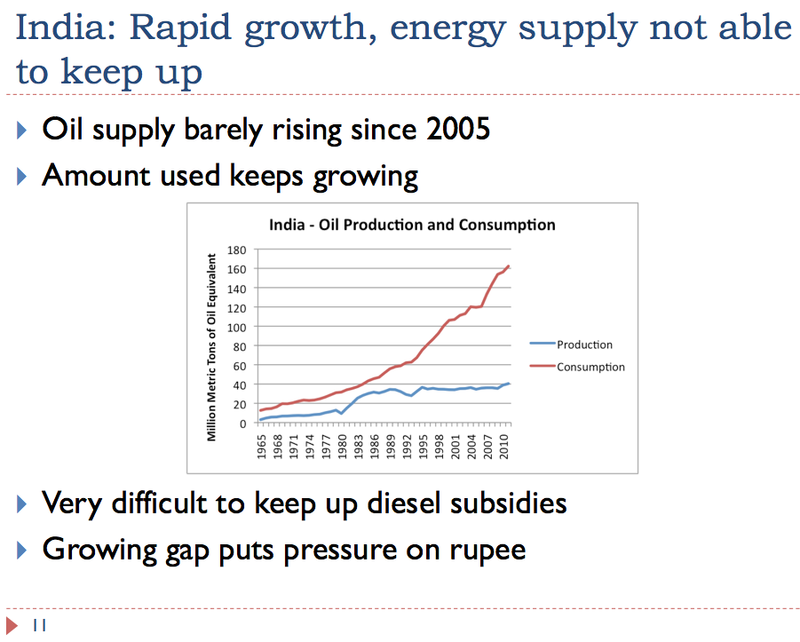 India is not an oil exporter, but it has been subsidizing diesel prices. The graph shown on Slide 11 shows that oil consumption has been rising rapidly, while India’s own oil production has been almost flat. This combination is problematic, because it becomes very expensive to subsidize increasing imports. The growing gap puts pressure on the rupee. It also leads to deficit spending, which in turn leads to a lower sovereign debt rating. India is now using more coal for generation than it is exporting. Furthermore, the rate of increase in supply and consumption seem to be diverging, with coal production recently becoming much flatter than consumption. Coal imports cannot be expected to rise indefinitely. China and Europe are both interested in purchasing coal imports, so there is competition for available supply. Also, coal imports tend to be expensive, because of the cost of transport. Coal import costs put pressure on India’s financial condition, just as oil imports do. Shortages of oil, coal and gas are already taking a toll on India’s economic growth, according to the Wall Street Journal: Grinding Energy Shortage Takes Toll on India’s Growth. It seems to me that government officials are making plans for the future without really understanding what a limited supply of cheap oil means. What it means, in practical terms, is that governments and citizens will be poorer, rather than richer, in the future. There will be fewer people employed in jobs that require external energy (practically all jobs in Western countries today). Because of energy constraints, wages of most workers will tend to fall in inflation adjusted terms. Governments will be particularly be affected, because there will be a drop in their tax revenue at the same time that there is more need for governmental services. It will be difficult to keep up pension programs and fuel subsidy programs. The higher cost of fuel (including cooking fuel, where there are subsidies) will mean that consumers will find fuel less affordable. Governments of countries that are particularly affected are likely to be subject to major changes, as citizens become increasingly unhappy with the status quo. 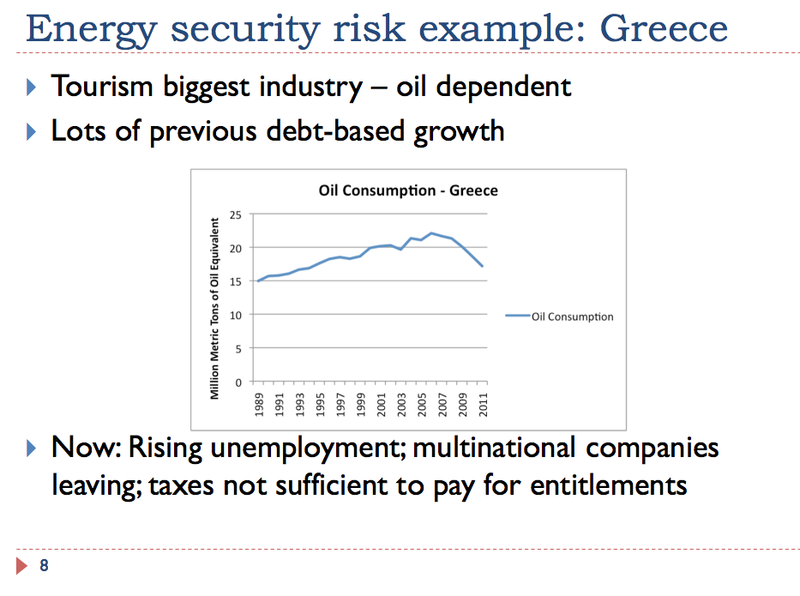 We can look at countries such as Greece to get an idea of the more direct financial security impacts that we can expect. In Greece, we find that high solar feed in tariffs are increasingly a problem, and have recently been reduced. Two electricity companies that rely heavily on natural gas have gone bankrupt. The possibility of rotating blackouts has been mentioned, if the country cannot afford to import high-priced natural gas and oil for electricity. As the highest cost-electricity becomes less affordable, an increasing proportion of electricity seems likely to come from the lowest cost fuel, locally produced lignite. 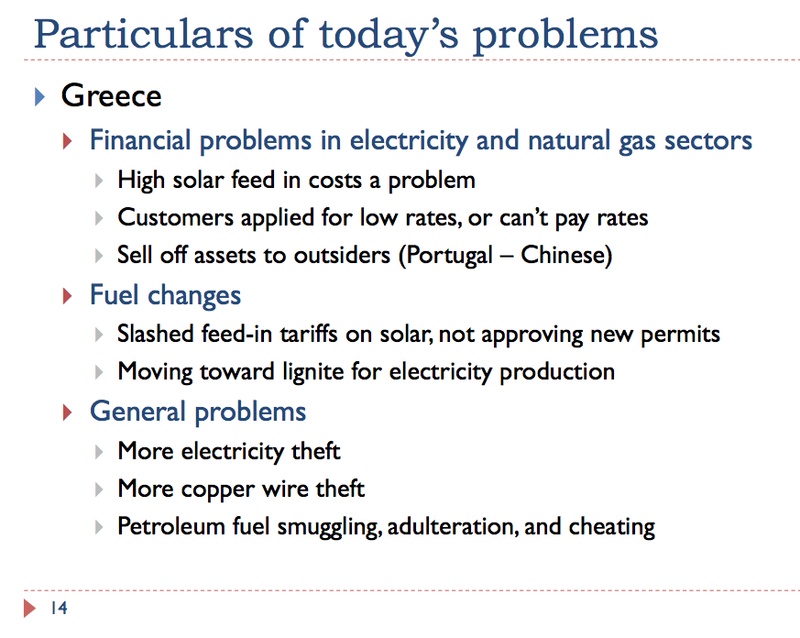 Also in Greece, non-payment of bills, theft of electricity, and theft of copper wire are already being reported as problems. In Portugal, China recently bought an interest in the company operating Portugal’s electric grid. The sale was necessitated by the poor financial condition of the company. Civil unrest is increasingly becoming a problem in countries with shortfalls in affordable energy. Greece. 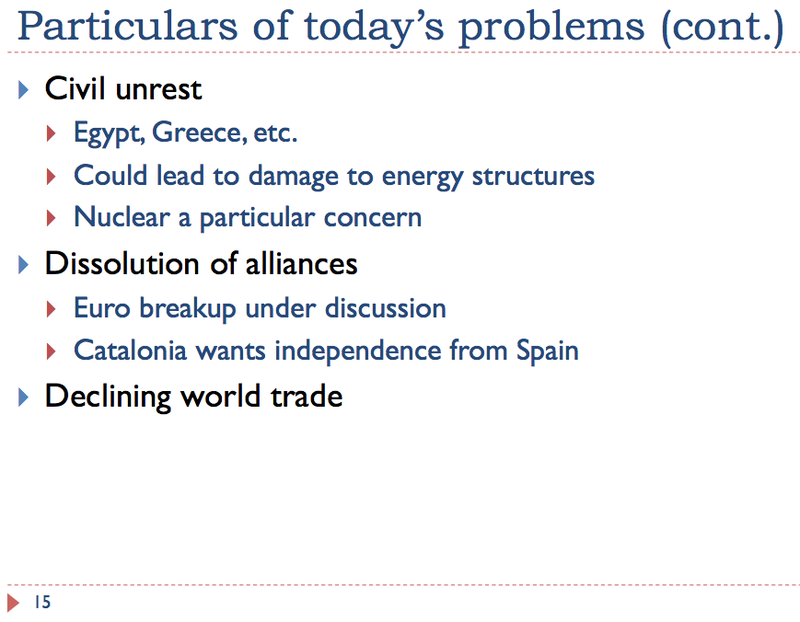 Spain, and Egypt all report civil unrest. If nothing else, such unrest could lead to damage to energy structures, such as electric power plants, including nuclear plants. As there is more competition for limited resources, the world as we have known it is likely to change. Willingness to accept foreigners into one’s country will decline, if there are not enough good-paying jobs to go around. There will be direct conflict over resources, such as China and Japan’s recent oil dispute. The Euro zone brought together unequal countries, nearly all of which were short on energy supplies. Now, we are hearing increasing reports about the possibility of the Euro zone’s financial disintegration. Even within countries, there is the possibility of rich areas wanting to be free from areas which are less well off. We see this dynamic playing out as there are growing calls in Catalonia for independence from Spain. As countries face the need to cutback, rather than grow, world trade can be expected to decline. In fact, the Wall Street Journal recently reported, “World Trade Volumes Decline for Third Month.” While it is not certain the current dip will continue, this is a pattern we can expect to see again. Conflict between countries, such as we are seeing between Japan and China, can be expected to lead to a drop in trade. The need for austerity measures in countries with financial problems is also likely to lead to a drop in trade. While it would be nice to assume “Business as Usual” will continue, and “a rising tide will lift all boats,” these situations look increasingly less likely. What we are instead seeing is that a lowering tide can adversely affect the energy security of many countries at the same time. This is not an easy thought to consider, especially for a country such as India, whose per-capita energy use lags far behind the world average. This entry was posted in Financial Implications, Introductory Post and tagged coal supply, energy security, India, oil price, oil supply, recession. Bookmark the permalink. this is the world scale classic mistake. Not even Nobel (economics) prizewinners understand that. with that level of economic genius an our financial helm, is it any wonder that we’ve hit the fiscal iceberg? It is a rare ascetic, who, when presented with a chance of warmth, comfort and even modest wealth, doesn’t grab at it. The brits, along with the rest of the European rag tag army of expats, grafted their philosophy onto America, and proceeded to loot that country of its resources. It is hard to understand how economists have gained as much respect as they have. Part of it seems to be their models which are too difficult for most to understand. If the models have some small predictive value in a BAU scenario, that seems to be good enough to “sell” the worth of the discipline. Ha, India unable to import coal, that’s a laugh. I can assure you, re:less of the “green” intentions of their leaders, the good citizens of Australia and Canada will happily export India all the coal she asks for. Both of those countries are very, very eager to ramp up coal exports. And the USA, of course. The USA is the Saudi Arabia of coal, we have plenty of it, and a wonderful logistics network of trains, barges and ships, ready and willing to export. Also, didn’t global trade hit an all time high in 2012? After hitting another in 2011? If so, how does this jibe with “declining global trade”? Is “declining global trade” actually something that we are seeing, or just something you are predicting. Those ships (of which there are plenty) are actually quite fuel efficient. That’s the joke of the peak-oil, localize nexus — they are protesting the most fuel efficient part of the international economy… large slow ships loaded to the gills. Increasing American coal exports isn’t a prediction it’s a reality. Check out the second chart! http://www.eia.gov/coal/production/quarterly/ Go go globalization! Export us some coal. I agree that the US will export coal to India, and perhaps Canada too. But how much this will ramp is a question. I expect more ships to transport coal would be needed. There is also a question of how much India can afford. It’s financial situation is getting stretched thin. I agree. “Peak ships”. The global supply of ships is finite. And also require oil. – it would have to be coal powered plants for use in electric vehicles (not likely for the cost, scale and duration of the transition required). That would still leave room for INDIVIDUAL countries or investors to make temporary profit from a coal boom. But over time the economic and financial problems will prevail. Is that correct? You are right. Besides the issues you mention, there is a timing issue for building the needed CTL plants, and a water needs issue for those plants. So it isn’t likely to happen. I would look for coal liquification to grow hugely, both around the world and in this country. The USA uses 5 billion gallons of water each day to water golf courses. That’s just golf courses mind you, not residential lawn watering. Every single day, 15 gallons of water per person are used just for golf. That’s a sign of how much excess water the USA has, in sum. Of course, they will need to insure the water can be delivered when they locate the coal liquification plants, but water is cheap and not difficult to move. Something tells me they’ll find the water for making gasoline at $3 per gallon. Pretending that gasoline will be unavailable in a country with abundant water, coal and natural gas is just silly. When you factor in CO2 sequestration via enhanced oil recovery (which almost pays for itself) then the green opposition will be impotent. Obama will probably brag about the increase in CO2 sequestration, actually.